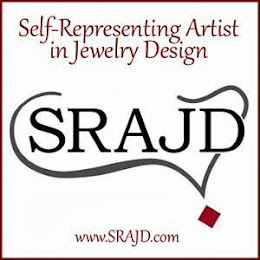 While searching the net a few months ago I serendipitously surfed right into a fantastic little Facebook group called 'Bead Soup Cafe' and from there discovered a whole new world of lovely artists and fellow crafters who have quickly become not only inspiration but an invaluable support system. As I became more a part of this group I grew to be smitten with the many 'blog hop challenges' that this group and it's 768+ members often do. I have followed many of these and participated in my first one a few weeks ago. 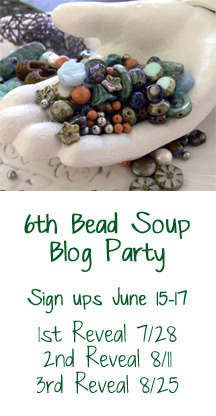 IMHO the pinnacle of these is events is the "Bead Soup Blog Hop" hosted by Lori Anderson. She has hosted 5 previous 'soups' with number 6 making its debut this summer. The BSBH has become so large at 399 participants that Lori has wisely decided to stagger the reveal dates into 3 separate events. I finally gathered up my gumption and signed up. What makes this challenge so special is that it forces you ever so gently out of your comfort zone and shores you up as you forge ahead into unknown territory. What I mean by that is that you are paired with a partner who has a very different style, background and design aesthetic. You trade a group of items, including a pretty clasp and a special focal piece along with a handful (or more) of coordinating beads and bits. 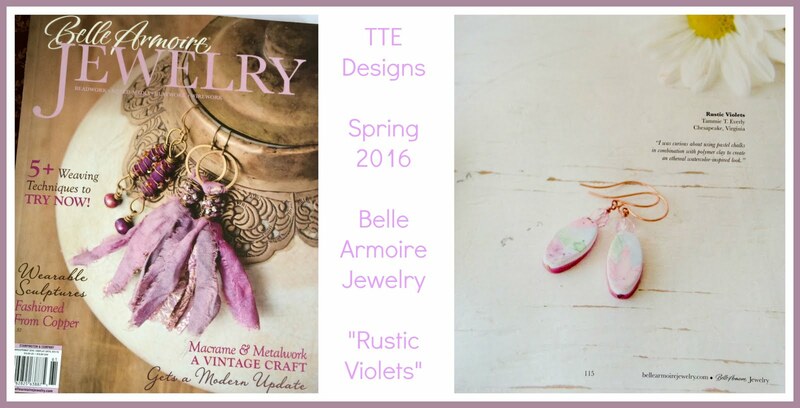 You then make a piece or two or three... with these items and blog about it to the world. Over the weekend I met my partner for this event, Shanti Johnson. Shanti and I have had the chance to 'chat' and share information about ourselves and our bead journey's. As I hoped our styles and aesthetics are very different. I am looking for something/someone to help me push my envelope at bit. From my initial introduction I see that Shanti is a very caring, earthy and free spirited lady. We share a love of the beach, our dogs and spirituality. I have all my other links on my Home page of my blog! She has so many lovely items, I really enjoyed window shopping her stores and blog. It was hard not to 'favorite' everything there. In addition to the beads of Bead Soup, I have handmade some cool polymer clay things in anticipation of this event. Since I knew we would be moving and in chaos for a while I created my items prior to our pack out, not knowing who my partner would be or what they would like. I now have a great amount of apprehension. I tend to work in a very symmetrical way. I lean toward the traditional and classic. I have tried to stretch out of my same old same old and make something cool. I hope that what I have put together appeals to my partner.... from looking at her work I have no doubt she will make something amazing from it all.